Your doll will look fabulous in this fun and trendy top. It is a fun spin on the classic dolman style, and features front and back lace insets, waistband, cuffs, two neck styles, two sleeve lengths, hip length and tunic length options. Recommended Fabrics: Main Fabric: Light-weight knits or light-weight sweater knits with moderate stretch, rayon (pre-washed) and lightweight polyesters with drape. Cuffs, Waistband and Neckband: Light weight knits or sweater knits with stretch (must stretch from 4” to 5”). Lace: Stretch lace trim, Light-weight cluny lace or lace fabric. Avoid lace that has large open areas. The lace does not need to have stretch, but should not be stiff. The pattern was straightforward and easy to follow - I made a shorter length piece. It would have helped if I hadn't (a) cut one piece wrong and (b) stitched the amended piece wrong!!! However, once over those hurdles, it was a simple make. 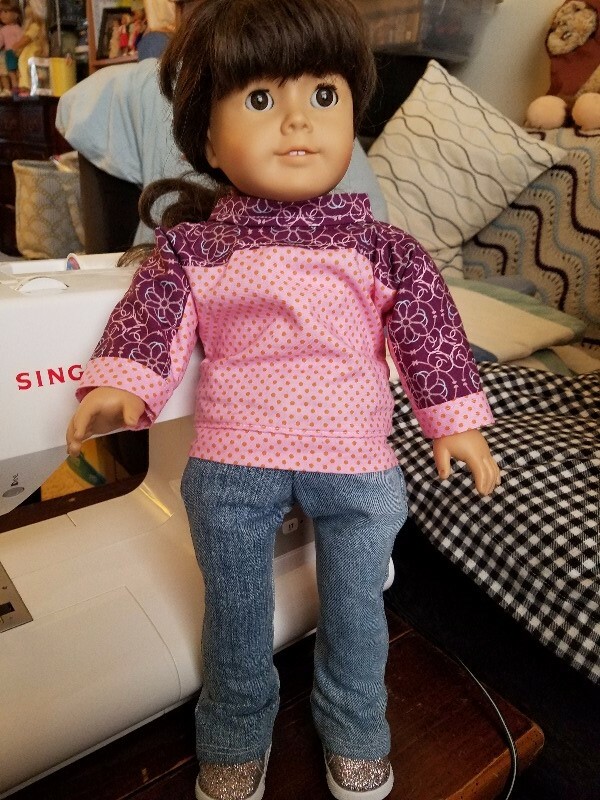 I need to make another because granddaughter has 2 dolls. Another T-shirt used up from the stash! Awesome! This is a great pattern. This pattern had great it and nice clean construction. I made two versions and both are lovely. Great, I always enjoy the lovely patterns, they have extensive directions and are easy to follow pattern. They are great and I thank you for the free patterns you allow us to have. I enjoyed making this pattern. The instructions were clear and easy to follow. I used scrap fabric on hand and I can't wait to make this again using other materials.